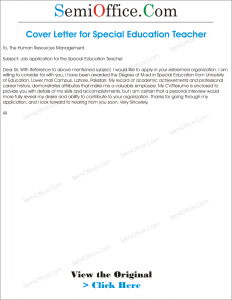 Sample job applications for Special Education Teacher Formats. Below cover letters for special educational teaching applications are taken from the special schools/colleges. I am writing to inquire about positions at Beacon-house School System. Your prestigious institution appeals to my strong interest in assisting to create a positive environment for the future members of our society. I’ve BS (Hons) in Clinical Psychology from University of the Punjab and have gained hands on experience of counseling, teaching and psycho-education to both children and adults during placements. It would be a great pleasure to work in your school. My CV is attached for your review. Thank you for considering me. I look forward to hearing from you soon. This application is to express my interest for working in Hamza Foundation as a Clinical Psychologist. I believe that my compassion and love to work with children would be a huge success for the school and my personal and professional growth as well. Please find my CV attached for your review. This is Zaira. I have done my MS. in Clinical Psychology from Government College University (GCU), Lahore. I have 13 months of paid experience of working with special need students. I have also done placements in my BS (Hons) program and during my MS in different institutes, catering the needs of special children. I am sending my resume and you can contact me for details. It is stated that I am a Clinical Psychologist and I have one year experience certificate from Mayo Hospital Lahore. Sir ! I have taken exams of ADCP ( Advance Diploma in Clinical Psychology), Sir ! I am sending my CV and in case if you select me I assure you that I will perform my work with sincerity. Sir I will be very thankful to you for this favor. I am desirous of offering my services as a Special Education Teacher in your esteemed institution. On the subsequent pages of this application are the concise details of my educational background and working experience. I request you to kindly apprise of my suitability for your purpose. I hope that my email finds you in the best of your health and spirits. I am a student of BNU who has recently graduated in BSc Hons Applied Psychology. I require information for any job vacancies or training at the institute. I shall be very grateful to you if you would let me know. For your review short details about my professional experience are attached. Dear Sir, With Reference to above mentioned subject, I would like to apply in your esteemed organization. I am willing to consider for this job, I have been awarded the Degree of M.ed in Special Education from University of Education, Lower mall Campus. It is stated that I came to know through your website that AHF Foundation is for multiple disorders. I have experience to work in Special Kids Inn as a Special Teacher. I have also done M.Sc in Psychology from Fatima Jinnah College for Women, Chuna Mandi. I have one year experience in Mayo Hospital as Clinical Psychologist (Internee). I have willing heart, patience and determination to work with them. My resume is also enclosed in attachment (file)s.
It is humbly submitted that I may kindly be given a chance to work in your institution, So that I can improve my experience and knowledge. I’m highly motivated candidate willing to fulfill challenging for this senior teacher job. As my CV shows, I already have some work experience with special children. In the past my experience was focus on teaching special children. In these jobs, I learned how to teach special children and deal with a variety of different people. I consider myself to be quick learner, open-minded and responsible. I am also proud of myself on being creative, eager to lean, motivated and flexible. With my attention to detail and being driven to work hard, I can offer support to your team. I am quite moved by the devotion of your institute towards the special children of our society. And I am interested to be a part of this service towards humanity. I am a graduate in International Relations from Kinnaird College and have a working experience (community service) of 2 months at Pakistan Girls Guide Association (PGGA) which was based on report writing, data entry and communicating with the girl guides. I am writing this to you as a new branch of AH Foundation has opened some time ago near my house, hence if there comes a need to hire new employees kindly consider me. To further acquaint you with the specifics of my background I am mailing my resume. I hope you will consider me. I am interested in offering my services for your reputed institution. I see the work that your institution is doing for the special kids and inspire by the efforts that your institution is doing. That is why I want to become the part of your institution. I have done Masters in Special Education and planing for M.Phil in near future. I have experience for Special education for more then Six years. I request your good self to give me an opportunity to prove my capability in your esteemed organization. I assure you that I shall give my best in getting the job accomplished. I hold the responsibility of keeping my energy levels and performance standards up and high. I have worked experience in Teaching (Normal education and Special Education) & administrative experience (as a position of Academic Coordinator ) at Foundation Homes NGO for Orphans At since September, XXXX to January, XXXX. My CV is enclosed herewith for your kind perusal. Expecting a favorable response from your end. 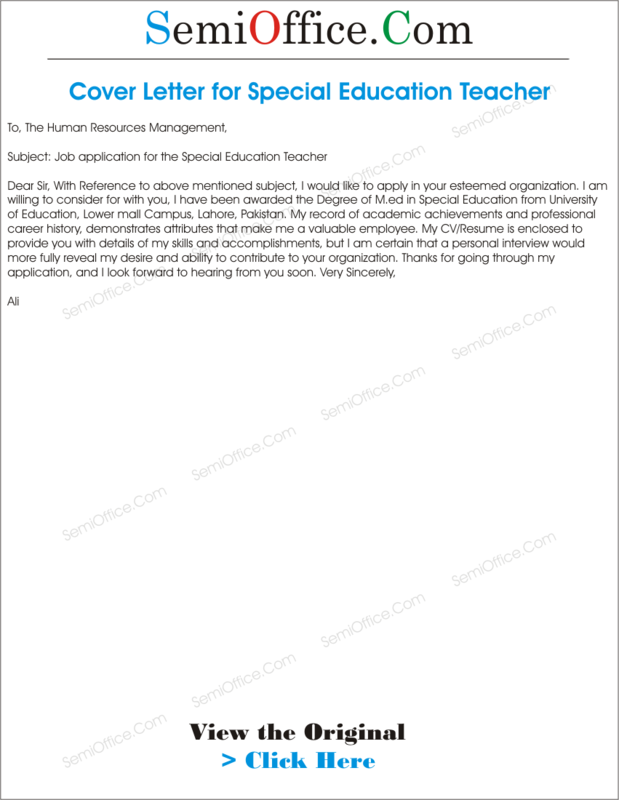 Below is a very good written format for teaching job application cover letter and you can change it for any job related to teaching profession. My name is Saima Kausar and I work with Fair-fax County Public Schools in Virginia as a teacher for Special Education specialized in Autism. Through my interest in spreading Special Education awareness, I heard about your institution through a friend who happens to be a teacher in Lahore. During my recent visit to Islamabad, I visited some private schools and observed that there are few students with autism, but the teachers and administration of the schools do not have enough knowledge and resources to address and deal with the behavior issues of the children. According to my perception, there is a dire need to address this requirement for students with learning disabilities. Not only do they need support with their everyday life, they also need to be treated equally as any other child. As a teacher for Special Education in Autism, I am very enthused about offering my experience, knowledge, and services. I can work with other teachers to create and implement behavior plans for students according to their needs. I can also train teachers through presentations and hands-on training to create an environment that is beneficial to students in need. These are necessary to assimilate students in a general education setting through Advance Behavior Analysis (ABA) therapy. Looking forward to hear from you soon. Thank you. I want to apply for a teacher job in a foundation who recruit to teach the poor & low income children.And my application form has to be the best,then only I will get selected.So,how should be my cover letter/ application for?I want to make it long. Surely we will send you a special cover letter for teaching position for this post very soon.